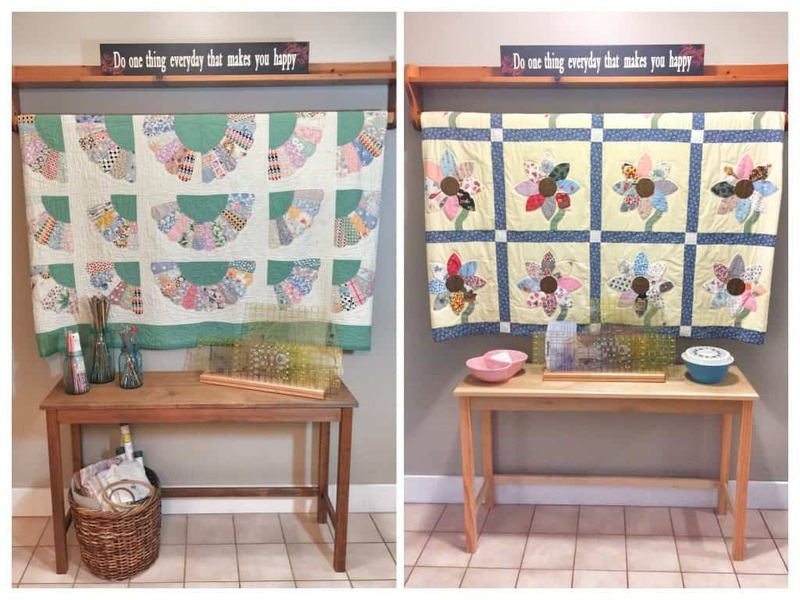 My original goal for the School Year Challenge was to focus on a different room in my house each month and complete projects which have been on my mind for years. 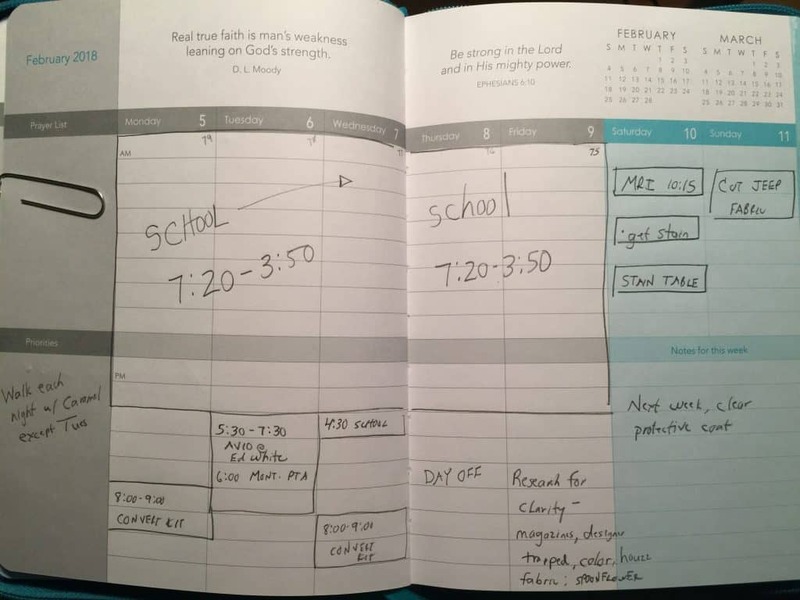 Then, in my perfect world, by the end of the school year almost all the rooms in our home would have had change(s) to indicate progress toward a final vision. It became apparent as I set goals for each month, many of the projects I have wanted to complete were stand alone (i.e. the apron, pajama pants, camera strap, and ornaments) and had nothing to do with room design and final vision for a home I love. In addition, I realized I didn’t HAVE a final vision for ANY room in the house. There wasn’t any cohesive plan of action. Only bits and pieces of ideas that I liked and stand alone projects (i.e. fabric for curtains, tables that needed refinishing, and chairs that needed to be repainted). 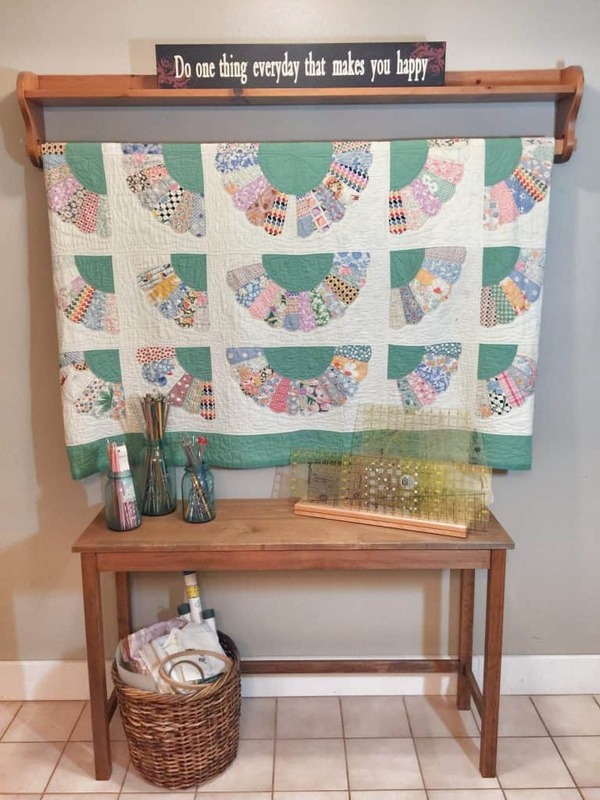 As I worked on projects each month, I identified a desire and a greater motivation connected to fabric related projects compared to painting/refinishing. What do I really want to do for School Year Challenge projects? What is my vision for creating a home my family loves? During the first 5 months of the School Year Challenge, I was ambitious and selected multiple projects along with a bonus project each month. At the beginning of the month, I would create a Project Wall using note cards to make a visual for each project I wanted to iccomplish*. They hung on my bedroom wall so I could see them everyday. There was no order to how I would do the projects each month, but I would feel self-inflicted stress related to my own thoughts of letting friends and family down if I didn’t get everything done (which I never did). 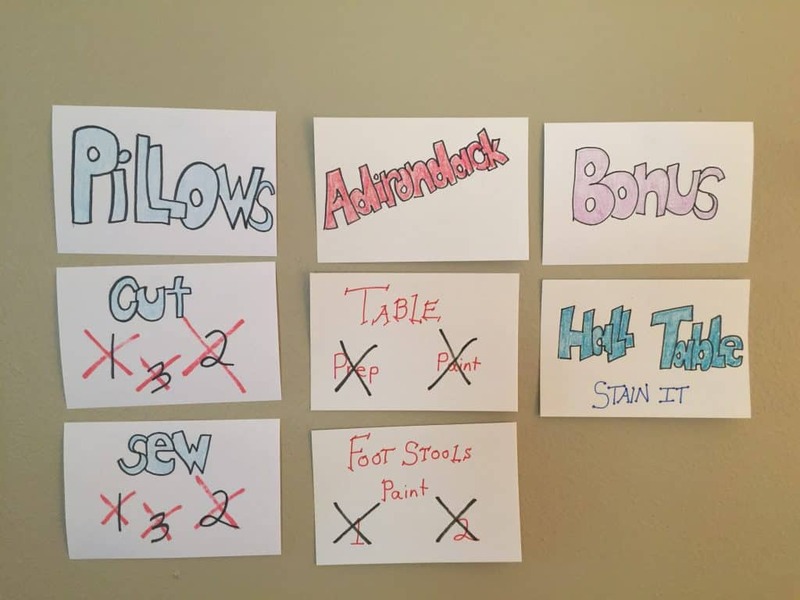 My rational mind knew no one would feel less of me if I didn’t get all the projects done, but my irrational mind would drive me to irritability and grumpiness, especially toward my husband, as I strived to accomplish 100% of the projects each month. 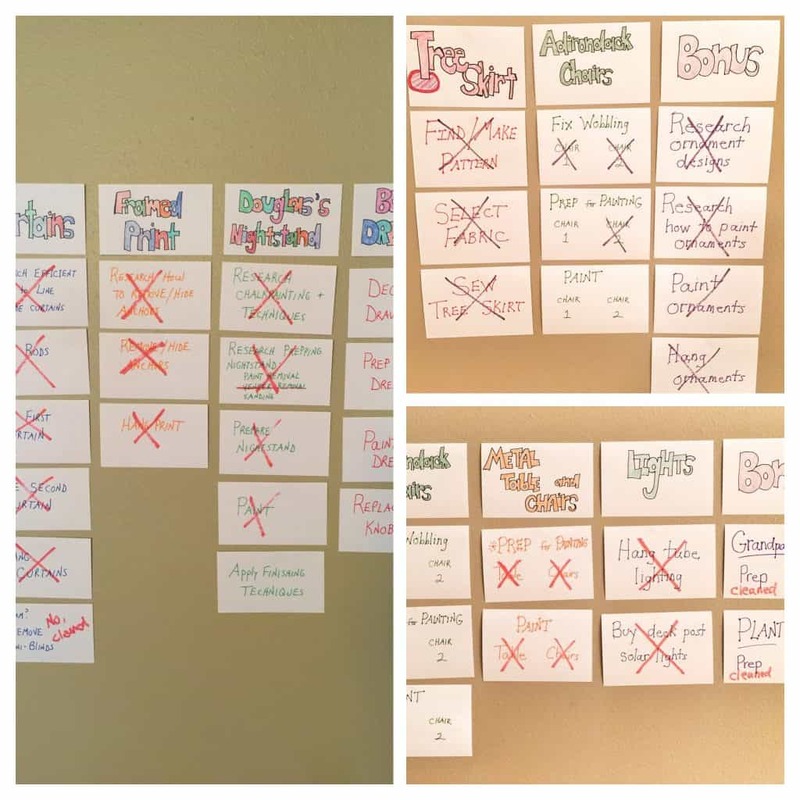 After careful self-reflection on my goals for the School Year Challenge and how it was affecting my life and my relationships with others, I streamlined January’s projects to minimize the stress I put on myself. The first month of 2018 brought some unexpected challenges but completing January’s Projects felt good. (Even though I didn’t get the bonus project done). So, I applied many of the same strategies for February. I decided I wouldn’t do bonus projects anymore and tried to be realistic in what could be done during the month keeping in mind all my other responsibilities. The Project Wall was noticeably smaller than February and so was the stress level! 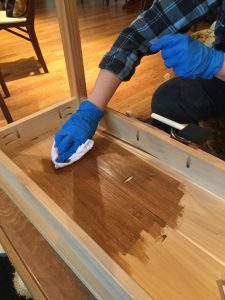 The plan was to apply a stain to the table and then top it with a protective coat. Picking out the stain was an adventure! Douglas, my husband, and I went to a local Woodcraft store. 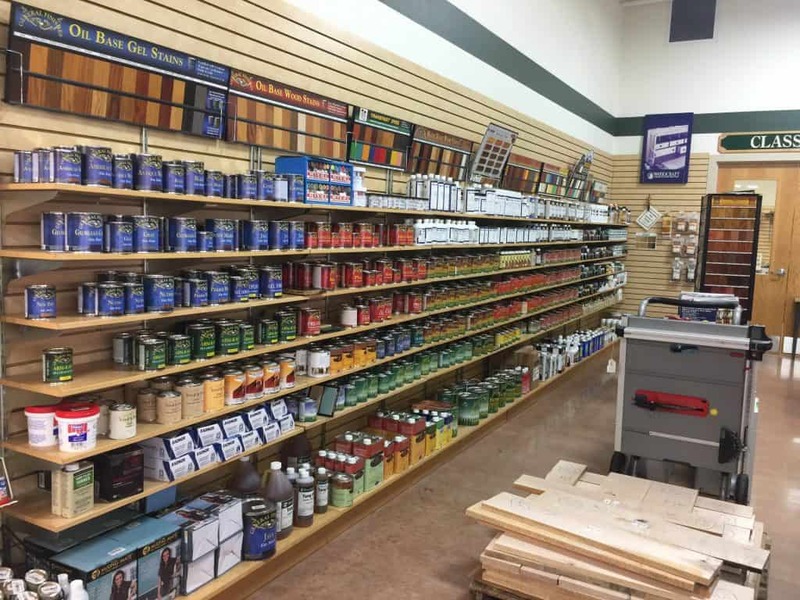 While he went to look at some of the wood working tools, I headed over to the stain section and was immediately overwhelmed! There were all kinds of stains…oil base, water base, gel, milk, and the list goes on! Most of the stains they carried were General Finishes and had a range of colors in each type of finish. I eventually made my decision based on the size of the can and color. They had three different size cans. The smallest size can (1/2 pint) was more than enough stain for my project and it was well within my budget. 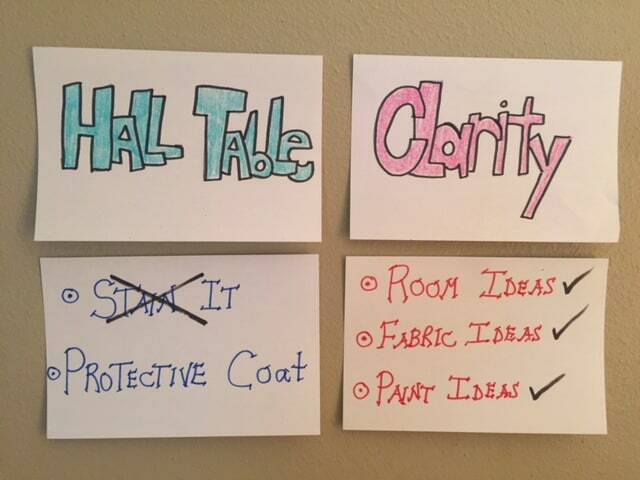 Not all stains had the smallest can, so I focused on finding a color I liked that was available in the 1/2 pint can. The winner was an oil base wood stain called Danish Teak. I applied the stain underneath the table to test it out. The color looked like what I wanted so I stained the rest of the table. 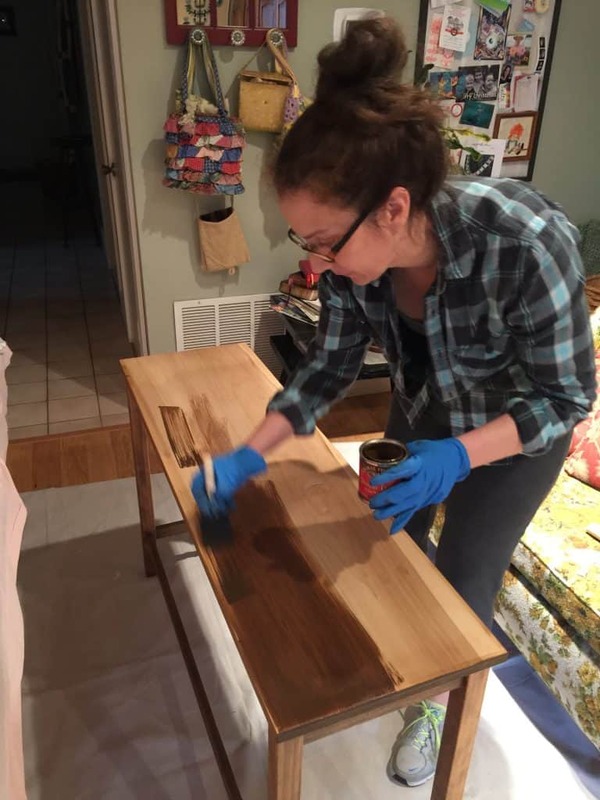 When it was all done, the color was a little darker than I thought it would be but the warm tone of the stain brings out the grain of the wood and invites a person to run her hand over the smooth rich top. Overall, I am very happy with the color! Because the purpose of the table is to hold supplies for my sewing room, I decided against putting a protective top coat on it. There won’t be any drinks placed on the top and the containers for the rulers and knitting needles won’t be moved around. If this table gets used for anything else, the protective coat would definitely be something I would want to apply to the top. I’ve worked with fabric before and have even done a slip cover and reupholstered a chair. But trying to make decisions on what fabric(s) to use for all the reupholstering projects I want to do overwhelms me and I become paralyzed, unable to make any decision at all. Some of my time spent in February was to do some research on fabrics. 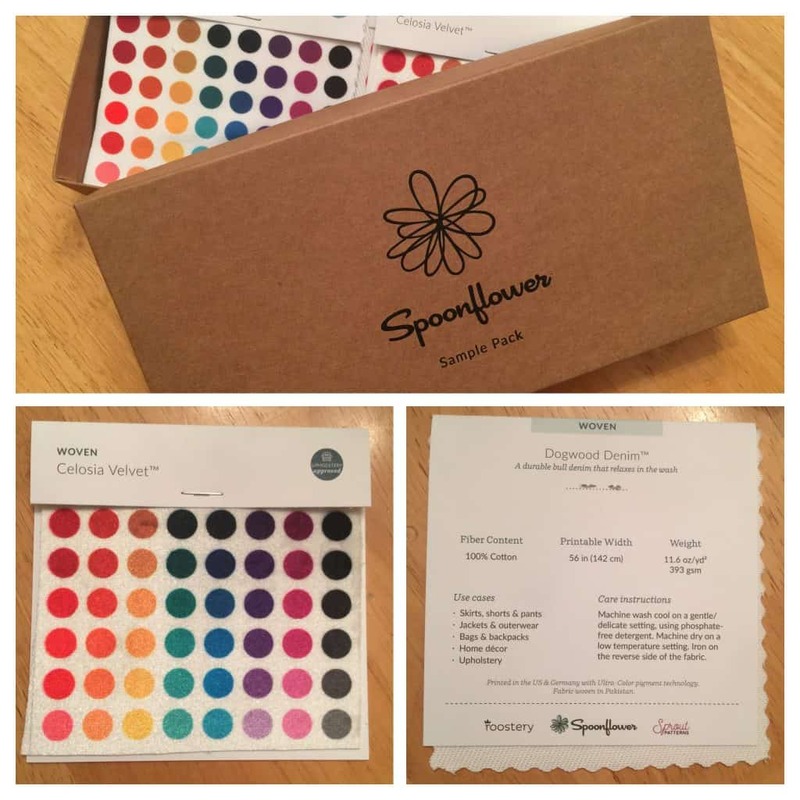 A few great resources that will help me begin my journey to fabric decisions are Spoonflower and a couple fellow bloggers. The blog for Spoonflower was were I found the idea for my sister-in-law’s Christmas gift. I roamed around on their site and ended up purchasing the camera fabric from them, too. So, when I wanted to learn more about upholstery fabric, I headed here to see what I information I could find. I discovered a section on their site that described all their fabric. As I was reading, I found myself wishing there was some quick way I could copy and paste the basic info given because there were more than 20 different types of fabrics. I wanted a paper reference to have when I was ready to work on other projects that weren’t connected to furniture. Just as I was getting ready to open of a Word document, I got to the bottom of the page and saw they had a Sample Pack! What!?! I ordered right away and was so excited when it arrived in the mail! Upholstery fabric is expensive and for most of my projects I will need a lot of yards. The patterns, the colors, the textures…there are too many options! A fabric choice mistake could be costly. Recently, I was cleaning up my email inbox and I opened up a newsletter from Tasha Agruso from the blog Designer Trapped in a Lawyer’s Body. She shared a link to a post by fellow blogger, Annie, at DIY Decor Mom on How to Mix Fabrics Like a Pro. 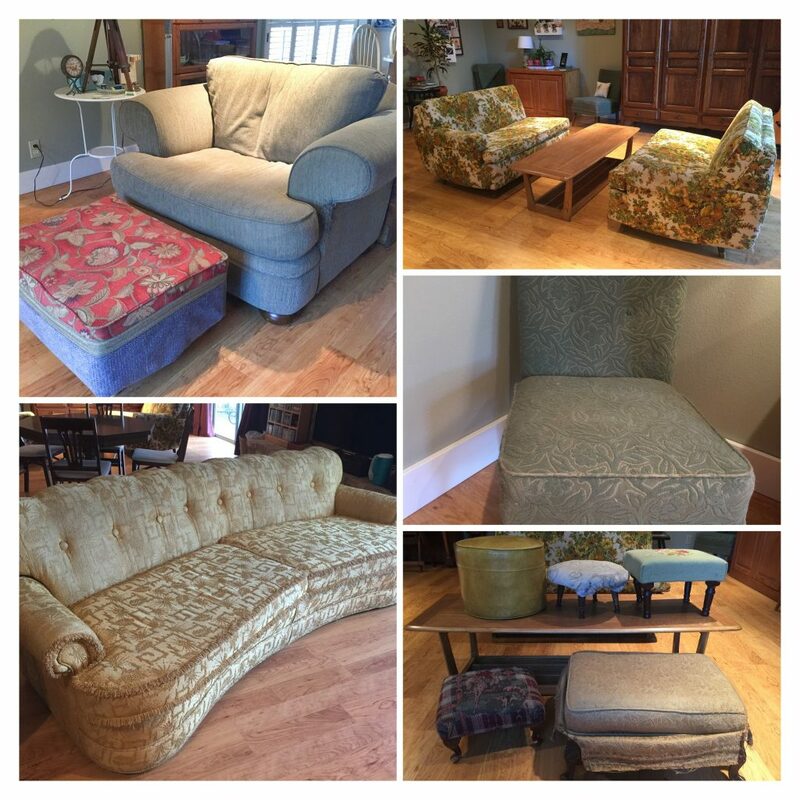 In the article, Annie provided several tips on combining multiple fabric patterns in a room. In her photos she showed fabric on furniture, curtains, and accessories found on shelves, walls, and floors. I realized the upholstery fabric wasn’t the only material I needed to have in mind when making a selection for what was going to cover the furniture. In addition, I should have an idea of what I want the rest of the room to look like too. Deciding on a broader vision for the room would provide a way for me to make sure the final upholstery selection would be the right choice. Like fabric, the idea of picking a paint color paralyzes me…there are too many colors and too many shades of each color! 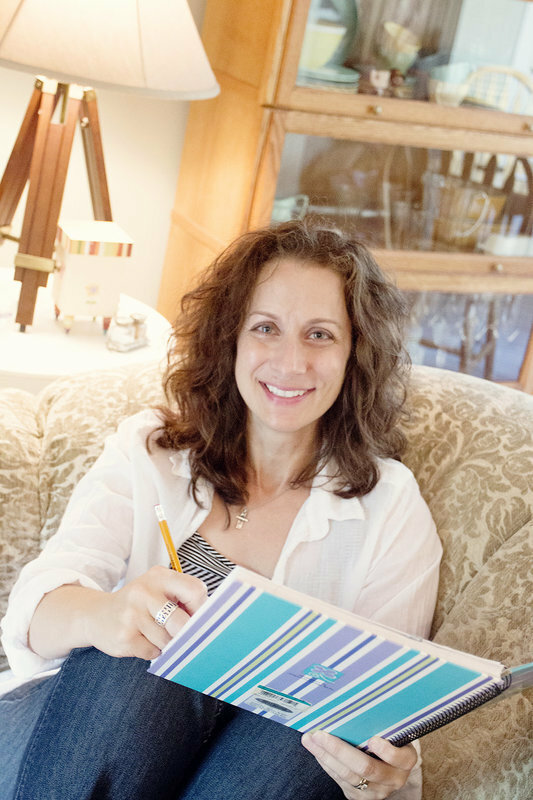 As I was scrolling through Annie’s blog, she had a free ebook titled “Designer’s Guide to Painting your Home”. Of course, I got it! The first page was five tips on picking out paint colors. The clearly written paragraphs provided a combination of thinking points and actions. I’m not sure what decision will come first – the fabric for the furniture or the paint – but I am feeling less overwhelmed by the idea of making either decision! In the email she described a free live training she would be doing. It was connected to a product she was getting ready to launch called Designer in a Binder. This product was a complete design system to create a home you love. The timing couldn’t be more perfect! After careful consideration, I decided this was something that would provide me a step-by-step process to create a cohesive design plan one room at a time, so I bought it! Designer in a Binder will definitely play a part in future School Challenge projects! The original budget for February was $70 – enough for stain, a top coat for the table, and fabric swatches. The total spent was a little over budget but Designer in a Binder is an investment that I believe will be more valuable than its cost! While I really liked the idea of blocking time off on my weekly calendar, I only did it during the first week. Even though I didn’t write down when I would work on my projects and do other things that needed to be done for the remaining weeks, I did do a lot of mental planning and that served me well this month. I only blocked off time to complete tasks during the first full week of February. I’ll give the planner and time blocking another try in March. I’ve got a lot going on next month and I know I won’t be able to keep it all straight in my head! Limiting the number of projects for this month resulted in a much lower stress level for me in February! I felt like I was moving forward on projects that I have been thinking about for a very long time and still had time to do other things I enjoy like cooking, exercising, and spending time with friends and family. Only one project was actually completed this month. However, taking action to gain clarity on future projects was productive, too. Finding some resources to help me plan and make decisions on future projects felt as good as iccomplishing* multiple projects!